The rose cut is one of the oldest cutting styles for diamonds. It emerged in the 1500s and was extremely popular in the 1700s through the 1800s. This older cut didn't unleash the fire and sparkle for which diamonds are known and, over the years, many of these gems were re-cut as diamond cutting technology improved. Some original rose cuts are still available at antique stores, and since the cut is making a comeback, diamond cutters are fashioning them again. Modern jewelry designers are creating edgy, contemporary jewelry with an interesting, old-world vibe by adding rose cut diamonds to their pieces. A rose cut diamond has a flat bottom and a domed, peaked top. The rose cut can take on numerous shapes. The most common are squarish-round, oval, and pear shapes. The earliest versions were thin slivers with three, triangular-shaped facets. As the years progressed, so did the number of facets on this ancient cut until the facet total reached 24. Later versions featured a second tier of facets that then culminated in a peak on the domed top, which added more sparkle. 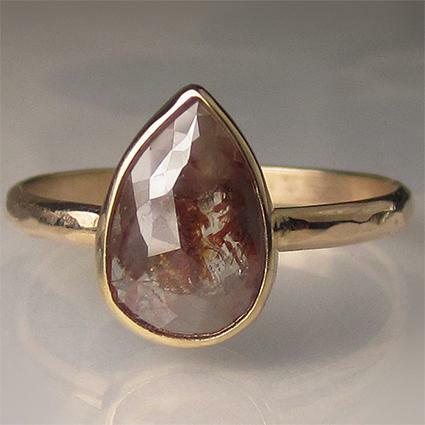 Most rose cuts found in antique jewelry from the 1700s and 1800s have some inclusions (foreign particles trapped in the crystal) in them, as well as a slight body color to them. The inclusions add a unique personality to each diamond. In those days, diamonds were evaluated by candlelight, and diamonds with a yellow or grayish color glowed warmly. Organized diamond grading didn't emerge until the 1940s. Lower grade diamonds are the perfect choice for the less brilliant rose cut. This is due to the fact that diamonds with a better clarity and color will fetch higher prices when cut to maximize fire and brilliancy. Antique rose cuts normally fall into the SI (slightly included) clarity grade and I or lower in color grade. Modern rose cuts typically fall into the SI and I (included) clarity grades and G or lower in color grade. Rose cut diamonds can often be found in antique jewelry created during the Georgian Period (1698-1830) and the Victorian Period (1837-1901). Antique stores are an excellent option for locating them. Keep in mind that solitaire engagement rings were not en vogue until 1895, so solitaire rose cut diamond rings will be difficult to find. Georgian and Victorian rings often featured clusters of rose cut diamonds in addition to other older cuts. Buying an antique on the Internet is tricky, so target reputable antique stores. 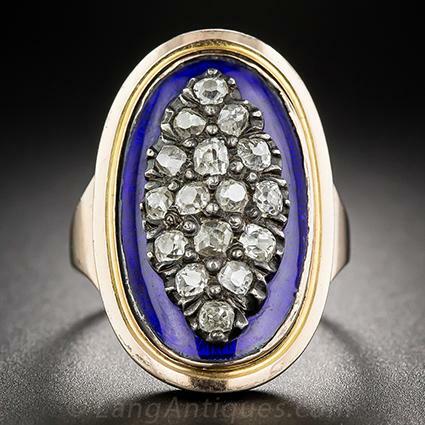 Lang Antiques has a wide selection of Georgian and Victorian jewelry that often including pieces that feature rose cut diamonds. They employ not only gemologists, but jewelry historians. Most of their inventory is online, with descriptive details of each item. Rings, brooches, and pendants that highlight the rose cut diamond may be available. Prices range from $2,000 to $6,000. They have a 10-day return policy, so if you are not satisfied, alert them immediately. Sales over $2,500 include overnight shipping and insurance. The Three Graces has an extensive collection of antique jewelry that often includes items with rose cut diamonds. The owner of this online-only store is a recognized antique authority and frequent lecturer on the subject. The Three Graces maintains a full gemological laboratory. Prices range from $1000 to approximately $7000. They offer free, same-day, fully-insured shipping. If you're not satisfied, notify them within three days and return within two days of notification for a refund. Some newly-created rose cuts are trickling into the market. These new rose cuts are, at most, a G color grade to light brown and typically weigh from .70 carat to 1.50 carats. Many are oval or pear shape. Rose cut diamonds are often encased in a bezel setting. This style offers the most protection for the diamond because it is completely surrounded by metal. LFrank is using the unique shape and color of the rose cut to create unusual rings. The diamonds are gray, brown, and colorless depending upon the design, and they can contain other diamonds as accents or have the rose cut diamond as a solitaire. The rings are available in 18k yellow, rose, or white gold, and custom designs are accommodated. Prices vary from $1,500 to $6,000, depending upon the size and number of diamonds. 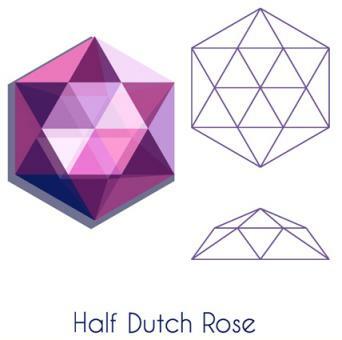 Etsy has a great collection of affordable rose cut diamond rings. The diamonds are small, opaque, and heavily included, which adds to their interesting look and lower price. However, many fall in the I3 clarity grade, which is very delicate, so ask about durability when corresponding with the jeweler. Rings are available in 14k gold of varying colors, and requests are encouraged. Prices start at $250. Custom made features contemporary jewelers who incorporate rose cuts into their signature pieces. Select a design and work with the jeweler to create your own version of it. Jewelers employ various colors of 14k and 18k gold and platinum. Prices start at $350 and escalate according to metal used and the weight of the diamonds. A rose cut diamond is a truly unique choice for a ring. Whether it graces a ring from a bygone era or is ensconced in a ring from today's contemporary designers, this unusual cut is a timeless show stopper.